Maggie Springtime Flowers from the retiring section. I used my new Spectrum Noir pens. I had been collecting the sets over the months and then treated myself to the sets I needed to complete the full set for Christmas and my MIL gave me some money towards the pen racks too so I now have a lovely, colourful set of pens to look at and hopefully use ;-). I used an 8 x 8 card because I printed my image larger than I wanted but instead of worrying about it I went with the flow and used a bigger card base. 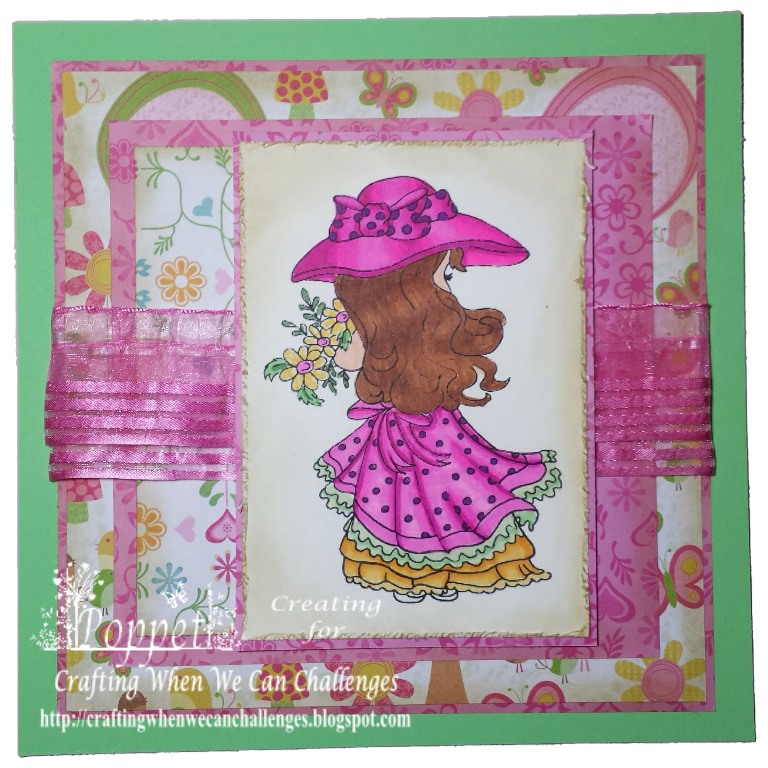 The green card I used for the base is from a Papermania pack, the mats are from DCWV Stack 6, the ribbon I bought about a year ago and never used until now. All edges have been distressed with DI, Old Paper. I've been trying to get more shading because I have all the SN pens and I like the dress but still can't get the hair but I think this image is a wonderful one which to practice shading on. Such a gorgeous card! Love that pink ribbon and the used papers look terrific. Thank you for sharing this lovely make with us at OurCreativeCorner! Love the colors on your card, Poppet. They are so cheery. A fun take on the sketch this week. Thanks for playing along with us at Sketch Saturday. A very cute card thankyou for sharing it with us at challenges 4 everybody.